Inset cabinets are simply stunning. The sleek yet classic design could be worth the investment for some but might be the deterring factor for others. A 15 to 20 percent cost increase from a similar style in full overlay should be expected. While inset cabinets are beautiful, temperature and humidity changes can cause the doors and drawers to expand and contract, which could result in them sticking. 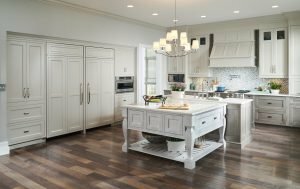 “Inset cabinets are one of the hottest styles but keep in mind they reduce the usable storage space of cabinetry,” says ACo owner, David Decker. One of ACo’s favorite cabinet styles is a frameless cabinet construction. The thicker box construction gives the stability, storage and simple, sleek design many clients are longing for these days. Frameless cabinets, also known as full-access cabinets, do not have a face frame or a center stile between doors. The function and appearance are two major reasons to consider frameless cabinets.